J.M. McDermott graduated from the University of Houston in 2002 with a BA in Creative Writing. He resides in Arlington, Texas with an assortment of empty coffee cups, overflowing bookshelves, and crazy schemes. You can read more about him at J.M. McDermott’s blog. Dogsland — (2011-2014) Publisher: Fugitive Rachel Nolander is a newcomer to the city of Dogsland, where the rich throw parties and the poor just do whatever they can to scrape by. Supported by her brother Djoss, she hides out in their squalid apartment, living in fear that someday, someone will find out that she is the child of a demon. Corporal Jona Lord Joni is a demon’s child too, but instead of living in fear, he keeps his secret and goes about his life as a cocky, self-assured man of the law. 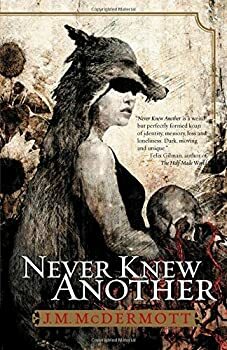 The first book in the Dogsland Trilogy, Never Knew Another is the story of how these two outcasts meet. J.M. 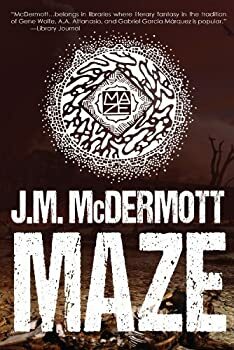 McDermott’s Maze is about a maze. Or possibly the maze: An unending series of stone halls and corridors which lurks in our primordial past, populated by monstrous creatures, loops and fragments of non-linear time, and a ragged band of humans who somehow got stranded there. The maze is never revealed to have any moral or mechanical logic; it just is, and the people who live there just do. Maze operates as a disjointed series of narratives about the people who have fallen into the maze. There are glimpses of their past worlds (a spaceship, medieval France, dystopian Texas), but the bulk of the novel is about the gritty, ugly process of surviving in an inhospitable place. It’s surreal, scattered, gruesome, and sometimes excellent. Tales from a Talking Board: Is anyone here? Read along and see. 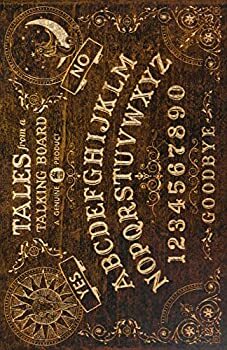 Tales From a Talking Board (2017) delivers fourteen shivery stories that involve spirit boards. In the US, we think of them as Ouija Boards, but that was actually a brand name; spirit boards, which involve a surface with the alphabet and an object that glides over it, stopping at letters, have been around quite a while. This anthology has plenty to please people who like the creepy, and lends itself to a dark autumn night pretty well. Some stories are more gory than others. At least one is flat-out funny. A few tales strain to wrap themselves around the spirit board and at least one has no divinatory prop at all. 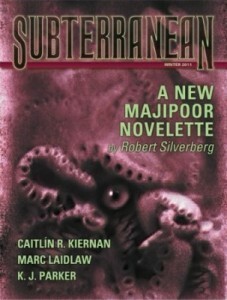 “The Melusine (1898)” by Caitlin R. Kiernan is this week’s offering by Subterranean Online. It is a wonderful story, written with an unearthly beauty. Kiernan imagines a steampunk circus that comes to town advertising its name in letters five-stories high, “shaped from out of nothing but the billowing clouds of red dust raised by those rolling broad steel and vulcanized rims." The circus is made of automaton mastodonts and living elephants, and no one can tell if the acrobats are mechanical or real. It promises miracles. Last Dragon — (2008) Publisher: The debut of a brilliant new voice that will change the fantasy genre forever. An intricate web of stories weave together to tell a tale of revenge, justice, ambition, and power. Zhan has been sent to find her grandfather, a man accused of killing not only Zhan’s family, but every man, woman, and child in their village. What she finds is a shell of a man, and a web of deceit that will test the very foundations of a world she thought she understood. A tale of revenge that grows into something more, Last Dragon is a literary fantasy novel in the tradition of Gene Wolf and Gabriel García Márquez. J.M. McDermott brings the fantasy genre to new literary heights with a remarkable first novel that will leave critics and readers alike in stunned awe. Women and Monsters — (2011) Publisher: The women and monsters of Greek mythology rarely get to speak for themselves. This collection of stories embraces the surreal and hallucinatory to tell the stories that are always absent from the official books of history. There are as many versions of the myth as there are grandmothers in Greece. There are always more myths, more variations on the song. Sing muse, for yourself. Disintegration Visions — (2012) Publisher: Sometimes it’s not what you say, but how you say it. These are the words of Crawford Award-nominated fantasy author J.M. McDermott (Last Dragon and Never Knew Another). McDermott says it with aliens, magical frogs, and the Berlin wall. Share his discoveries in nature, bug-infested basements, and visions of death. Visions of the future. Visions of forgotten pasts. It’s all here in J.M. McDermott’s powerful collection of dark fantasy and horror from Apex Publications. The Lady or the Tiger, Death Mask and Eulogy: and Other Re-Imaginings — (2012) Publisher: In these tales of high fantasy, and science fiction, cities grow on the back of humongous lizards, where a young boy crashed down must choose his lady or a tiger. A mostly nameless wanderer seeks to trade everything he has to find a homeland — skin, bone, pain, and soul. A basilisk builds a palace of stone made of prisoners, and he is honored as a king. There are nightmares, dreams, other myths and other re-imaginings. Join critically-acclaimed fantasist, J. M. McDermott, in journeys of the imagination. King Basilisk’s Palace — (2012) Publisher: A basilisk king turns prisoners to stone who gaze upon the monster. His servants use these gruesome building blocks to build a palace on the sea. Rebecca sails from Antioch in chains, to be turned to stone among other prisoners. Unlike the others, Rebecca is blind, and will never see the king to turn into stone. CLICK HERE FOR MORE TITLES BY J.M. MCDERMOTT.